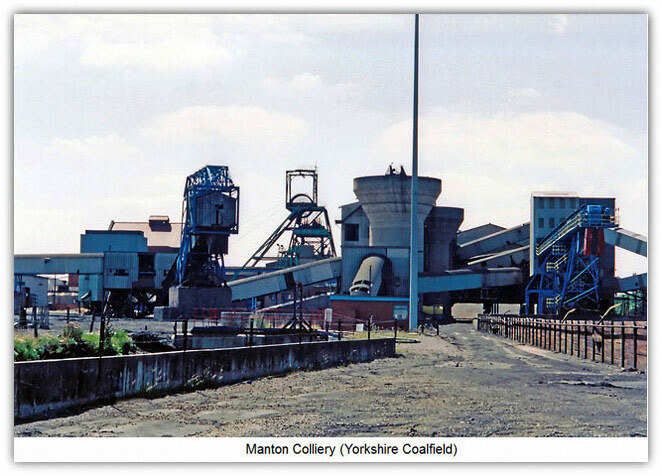 Manton colliery (Nottinghamshire), sunk in 1898-1899 to 1904 by the Wigan Coal and Iron Co Ltd, to the Top Hard at 723 yards (661m), coal reached on 3rd June 1904. The colliery two miles east of Worksop was originally called Newcastle Main until 1907. A new shaft No4 was begun by the company in 1946 and continued by the NCB to the Parkgate at 957 yards (875m), sump at 966 yards (883.23m). 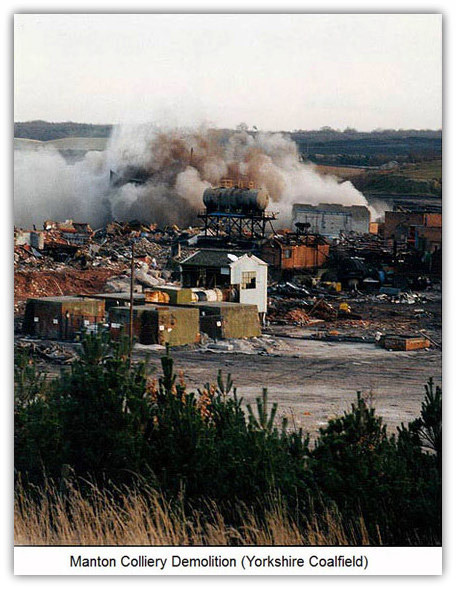 The colliery had been transferred to the No1 Worksop Area of the North East Division soon after Nationalisation in 1947 and subsequently South Yorkshire Area but was reallocated to Nottinghamshire Group in 1993 production ceased on 12th February and was closed on 18th February 1994 after 88 years. Shaft positions: SK67 North West, No1 shaft 460738,378281, 150 yards (137.5m) deep, used for pumping water, surface level 43m, No2 shaft 460697, 378267, No3 shaft 460854, 378160. All 3 shafts were 20’ 0” (6.1m) dia. The sinkers went on strike in 1903. As with most pits of the time ponies were used underground for coal haulage and then continued on supplies transport until the 1960s. There was a fire on Tuesday 22nd Nov 1921 the Manager’s office was a wooden one, Captain BH Pickering in charge at the time. Pithead baths were built and opened in 1932 at a cost of £25,000, with 192 shower cubicles and 2,400 clean and dirty side lockers. The canteen was moved and re-opened on 12th Sep 1942. A Lambton flight was operational in 1956. A new surface was constructed including a new Coal Preparation Plant with a throughput of 300 tons per hour by Blantyre and Co was operational by 1962 and production from the Parkgate began in 1962. 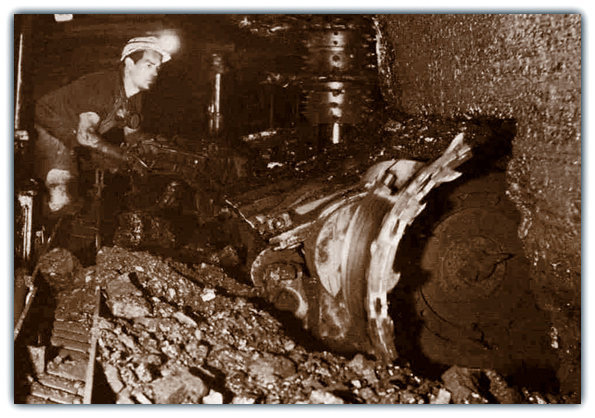 A further UC shaft No4 was sunk and completed in 1967 with tower mounted Koepe 4-rope AEI Ward Leonard electric friction winder raising 12 ton skips. It was the first for a transistor controlled Thyristor amplifier for generator field control. The Parkgate seam 5’ to 6’ (1.5m to 1.8m) was worked leaving between 8” (0.20m) to 15” (0.38m) of coal top to form a good roof. The rock temperature was 97F (39.4C) and the dry bulb temperature in the return 98F (40.4C) with a high methane emission. Twin 1,100 hp fans were installed in 1967. A mini-hydrack drilling machine for methane holes was in use by 1972. Locos were introduced in 1967 complete with an underground loco house. A trepanner with a turret was installed on 15s Parkgate panel in 1967 as shown in the photograph. Lord Robens Chairman of the NCB visited the colliery in 1968 and was escorted by JJ Mallen the Manager. A scheme costing £1m was completed in 1971 enabling the colliery to use the methane in surface boilers. There was a Tube bundle monitoring system from each district. At No1 shaft 4m gallons a day was pumped, 2m being sold to the local authority for drinking water. Computer control for production installed with closed circuit TV for the surface. A 985 yards (900m) motorway for high speed haulage and manriding was driven in the Parkgate scour as it gave excellent conditions. Sir Derek Ezra MBE visited the colliery in 1971 and Sir Robert Haslam in 1986, Chairman of the NCB at the time. Alex Eadie (Lab) Minister for Power visited the mine in 1976. The first one million tonnes of saleable coal was produced in February of year ending 1978-79. On 4th Feb 1983 there was a dispute and walkout over bonus payments. Underground cover was suspended by 150 Deputies for 2 weeks and management had to cover for safety. There was a loss of 40,000 tonnes of coal. The first coal wound after the miners strike of 1984 was on 20th Nov 1984. A new NUM banner was unfurled 1982. The First Aid team won a trophy 1982. 1 million tonnes of coal was produced again in 1986. In 1991 over million tonnes was produced from Flockton seam F12s in 6 months. The pit was officially closed 14th February 1994. 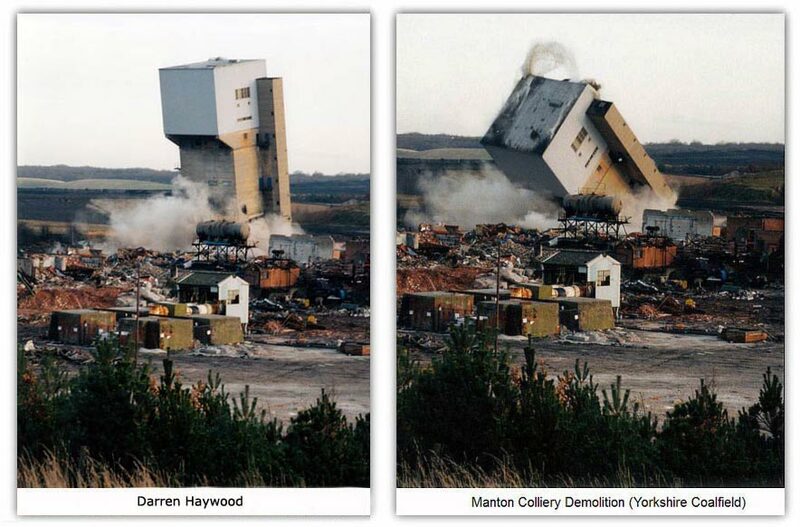 The shafts were filled and sealed and the headstocks were blown down on 6th December 1994. The final train left the site on 4th October 1995 (No 58036 Main line). Manpower at closure was 473 underground and 76 surface men, plus 288 underground and 86 surface private contractors.